The newest addition to the Jeanneau Sun Odyssey line, the Sun Odyssey 479, benefits from the latest innovations and inherits the finest traits of this iconic line. From the design cabinet of Philippe Briand, clean lines and an elongated hull with moderate freeboard give the the Sun Odyssey 479 an extraordinary aesthetic value and performance. This elegant offshore cruiser offers an exceptional interior and deck plan designed with ease of handling in mind. Every detail has been conceived to offer the highest quality cruising experience. Bathed in light, the interior affords the volume and comfort typically found on a 50 foot sailboat. 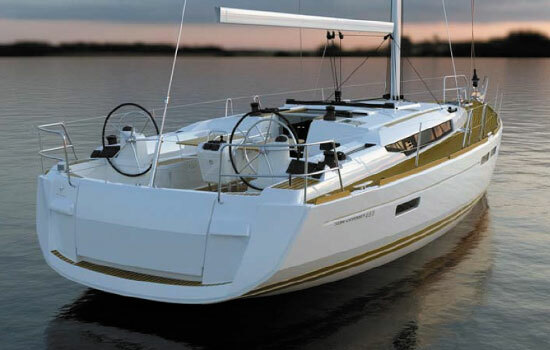 Aboard the the Sun Odyssey 479 you will find many principal attributes of her inspiration and “big sister” model, the Jeanneau 51. This Sun Odyssey 479 features 4 cabins and 4 heads, a spacious saloon and galley, and attractive upgrades and options to make your experience a great one. Semi batten mainsail, Roller Genoa, Lazy Jack with Lazy Bag, Electric Anchor Windlass. Semi rigid dinghy with 5hp Outboard Engine, Cabin Fans, Radio, CD Player, Electric Toilet Pumps, Linen, Towels, Snorkeling gear.. * For full specs, please Click Here.